A few weeks ago I wrote about the less-than-targeted email campaign I received from Piperlime. I suppose it's only fair that I offer up this follow up, especially since they listened to what I said...so much so that it's almost scary. It's like they read my blog and created this email campaign just for me. That's how it should feel when you're successfully targeting your email campaigns. Let's rewind. When we first reviewed Piperlime's lack of email segmentation, I realized it was because I had not yet set my preferences. I wrote about that, and also my distaste for shoes in general. I also mentioned that I bought slip ons since I can't wear flip flops all the time. The other day I received another email from Piperlime. This time it wasn't for women's shoes and flair jeans. It was like they crafted the email for my eyes only. The subject was "Easy slip-ons + casual Friday style," a subject line that knows the way to my heart. 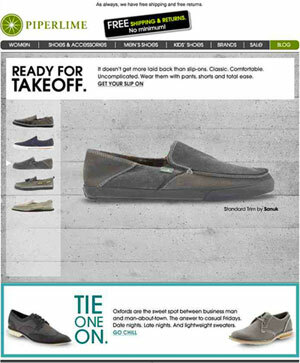 The email included an animation that scrolled through several styles of slip-ons. I didn't even have to go to their website to peruse the selection. If an email marketer is successfully segmenting their subscriber lists, an email should seem as if it was written just for the recipient. It shouldn't be easy to see how or why a subscriber set off a trigger. Perhaps Piperlime was just trying to get back in our good graces with this email campaign. More likely, their preference center works effectively. Now I'm not confused as to why I'm receiving emails about women's shoes, and may even purchase a new pair of shoes. My old ones are starting to look like they're the only pair I wear...casual Friday or not. There's still a problem with Piperlime emails for me. There's no option to change the frequency! For such a huge company it is very dissapointing that they do not offer this option. The 3+ emails per week (seemingly increasing expomentially) are really getting me to the point that I might unsubscribe. Even though I offer from them fairly regularly (every couple months). The only motivaton for staying on the list is the occasional coupon code.